he copy of Money magazine offered to Leon Spinks during his flight to New Orleans was full of splendid suggestions for a new career. 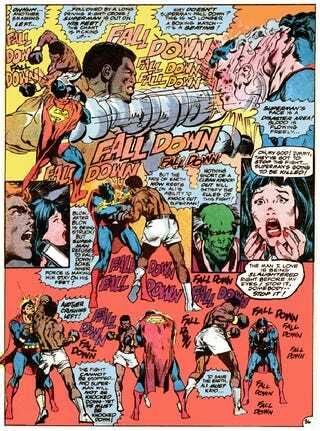 Soccer coach, that was something the heavyweight champion might want to think about. Nowhere is it written that soccer coaches have to run through strange cities at five in the morning. Or spend great hunks of each day inside expensive hotel rooms that offer baskets of apples and Gouda instead of X-rated film selections. And there aren’t small armies of people telling the cover-boy soccer coach to kick this, do that, no this, no, no, no . . . armies that depend on the heavyweight champion to provide their per diem expenses. The magazine went unread, of course. Leon Spinks was in Louisiana to defend his title against Muhammad Ali, a 36-year-old body with the staying power of Tutankhamen. Ali was the favorite. Ali was the attraction—the once, twice, and future champion. 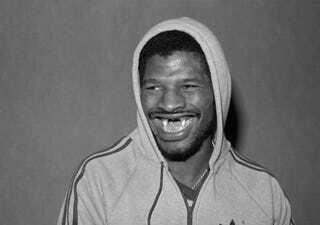 Leon Spinks? Come on. Just another name on an expired driver’s license. “Did you hear what Spinks did when he came off the plane?” The lawyer is talking to a sportswriter after the fight. The party is at the Windsor Suite of the New Orleans Hilton. Sportswriters are badly outnumbered by designer suits. Worse yet, the lawyers had heard all the best available fiction.